Georgian Minister of Foreign Affairs Davit Zalkaliani says that German Chancellor Angela Merkel's visit ten years after on August 23-24 confirms how important Georgia is on the German political agenda. Zalkaliani claims that Georgian-German relations have been “very intense” in recent years, which is proved by bilateral visits from Georgia to Germany and vice versa. "I have recently had a visit to Germany where the active dynamics of relations between Georgia and Germany was once again confirmed. As you know, Germany is an active supporter of our European and Euro-Atlantic integration, which was clearly reflected in recent decisions, including at the NATO summit, when Germany supported the essential provisions in the NATO declaration. “Angela Merkel's visit further underlines the importance of our relations and the fact that Georgia is constantly on the German political agenda," Zalkaliani said. The minister stated that during the meetings with Merkel, talks will touch upon bilateral relations as well as cooperation in multilateral formats. Zalkaliani also spoke about the opposition’s remarks over the visit. "We have heard the statements of our opponents that Georgia has disappeared from the agenda of the international community. 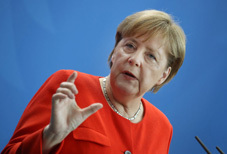 To put it mildly, this is not serious, as Merkel is due to visit Georgia in a few days,” Zalkaliani said. 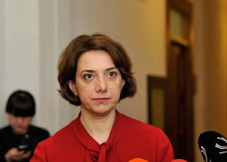 Salome Samadashvili, a member of the United National Movement opposition, believes that “it is very dangerous” for the country that nobody talks about Georgia at high-level foreign meetings. “When neither the Russian President nor the German Chancellor or the President of the United States talks about Georgia, Russia believes that it can continue its violent politics against Georgia. “Russian leaders think that they can keep relocating borders and kill our citizens without any punishment because Georgia is no longer an item on the international agenda,” Samadashvili said, referring to the recent meeting of German and Russian leaders. "Of course, it is very good that the German Chancellor has decided to visit the region, including Georgia. We will have a chance to meet with the Chancellor and discuss the challenges facing the country both regarding security and internal democratic process,” Samadashvili said. Merkel first visited Georgia in the wake of the Russia-Georgia 2008 war.